From TB to Nose Cancer. 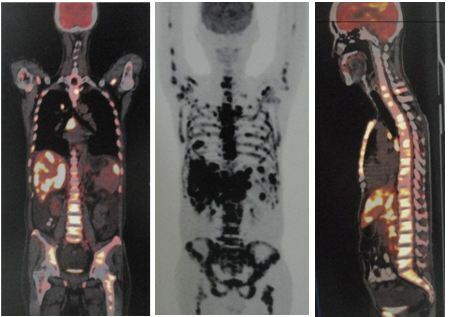 After chemotherapy and radiotherapy, extensive bony metastases. What has gone wrong? FR is a 40-yer-old male, private school teacher from Indonesia. 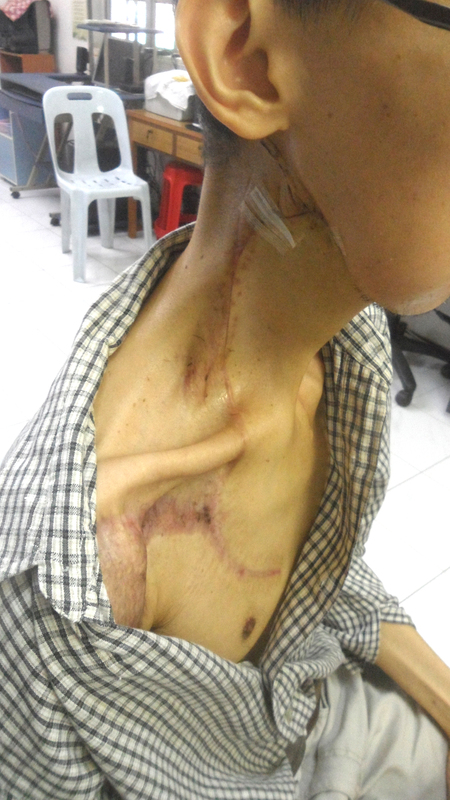 In November 2017, he had a swelling in the left side of his neck. A biopsy was done by a doctor in his hometown. FR was told he had tuberculosis (TB). He was prescribed Rifastar — a TB drug. FR took Rifastar for about two months. Another lump appeared on his neck. FR went to see another doctor. He was again told he had TB. This time he was prescribed more drugs: Rofamtibi, Lovesco (antibiotic) and Lesichol (for liver). After one month on these drugs the swelling in his neck became smaller. But after the second month, the drugs were not effective anymore. FR went to a hospital in Melaka for further management. 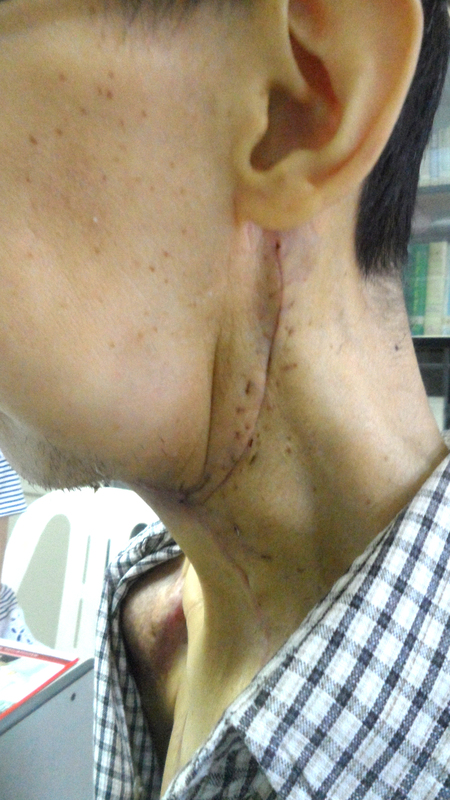 A trucut biopsy of left cervical lymph node on 28 March 2018, suggested a metastatic undifferentiated or poorly differentiated carcinoma, highly suggestive of undifferentiated nasopharyngeal carcinoma (NPC – nose cancer). CT scan report stated: Tiny right middle lobe lung nodule and aorto-pulmonary lymphadenopathy (1.1 cm). Infection or metastasis ? No suspicious bony lesion. MRI showed multiple enlarged left jugular nodes as large as 4 cm. There is no obvious tumour in the postnasal space. FR was referred to the oncologist in the same Melaka hospital. He was told to undergo chemotherapy and radiotherapy immediately because this was a Stage 4B cancer. FR came to Penang and consulted us. He was prescribed some herbs for his NPC, lung, lymph nodes and liver. However, FR’s father asked FR to undergo medical treatments instead of just relying on our herbs. So FR went to a private hospital in Kuala Lumpur and had six cycles of chemotherapy with cisplatin — one cycle every week. He also received 33 sessions of radiotherapy. In all, the cost of the treatments was about IDR 200 million (approximately RM58,000). 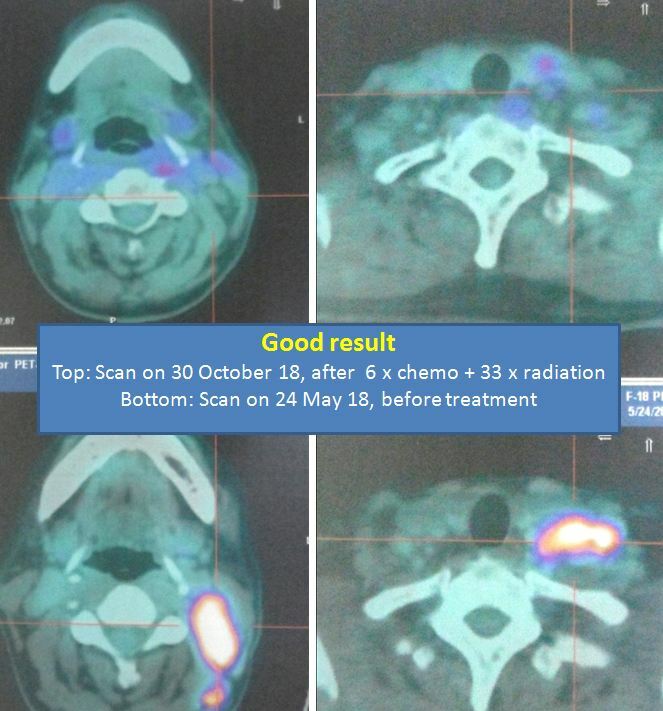 PET scan results below showed amazing results after the medical treatments. The swelling were all gone! But there is no time to celebrate yet. Unfortunately, the PET scan also showed (below) that the cancer had spread extensively to the bones — the skull (white arrow), T4, T5, T6, T7, T8, T9, T10, T11, T12, L1, L2, L3, L4, L5, and sacral vertebrae, head of humerus, left scapula, sternum, right 3rd and left 6th rib, pelvic and femoral bones. FR was told to undergo more chemotherapy, this time using carboplatin + Gemcitabine. Six cycles of this treatment is going to cost RM42,000. FR refused further medical treatment and came back to seek our help for the second time! This is indeed a sad morning for me to see how “lost and fearful” FR and his wife were. Why the extensive spread to the bones? And this happened so fast. 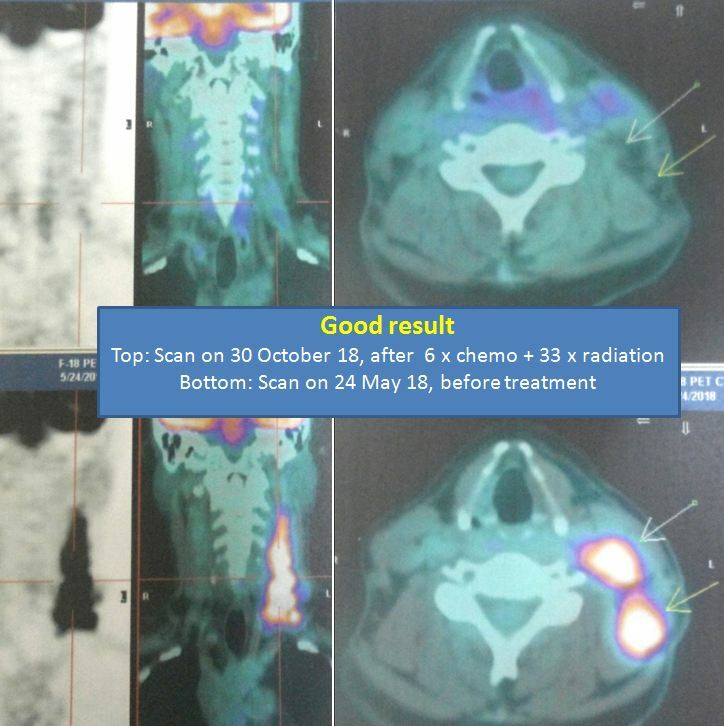 Barely five months ago — the PET scan in May 2018, before chemotherapy and radiotherapy — showed no traces of bony metastasis. What has gone wrong? Most patients, after being diagnosed with cancer, generally opt for the so called “scientific, proven” medical treatment. Yes, they believe medical treatments can cure their cancer. I have no problem with that. By all means, go and see your doctors and do whatever they want you to do. I also tell patients that if or when these treatments fail, they can come to us. No hard feelings. We do NOT promise we can cure you. But we shall try our best to help the way we know how. page114: Fifty percent of those who receive a cancer diagnosis — and up to 90 percent with some kinds of cancer — are cured with conventional medicine. page 115: Eastern medicine, e.g. Chinese and Ayurvedic medicine, are excellent for preserving health, but they are not always fast enough when cancer is already established in the body. When the situation is urgent, Western medicine’s surgery, radiation and chemo take effect immediately. page 117: When cancer is detected during its early stages, conventional medicine considers that there is a cure … the treatment is usually aggressive. In these cases, it’s considered more acceptable to tolerate serious adverse effects, since a cure is the intended outcome. page 117: When cancer is more advanced or has spread to other organs, conventional medicine generally doesn’t have the tools to cure it. A long-term treatment can help control the cancer, reduce pain, relieve symptoms, avoid complications and sometimes extend a person’s life. I am sure many oncologists everywhere in the world would say the same thing as Dr. Nasi. I guess most patients are also on the same page and believe their oncologists fully. Perhaps that could be the reason why FR’s father told his son to go for medical treatments instead of just relying on our herbs! But look at what happened to FR. Barely five months later, FR ended up with more metastases than anyone could ever imagine. Why? Is this the first time such a thing ever happen? My answer is NO. I have seen similar cases. I have been helping thousands of cancer patients over the past two decades. Most of them who came to us had already undergone medical treatments. These treatments failed. These patients came to us as a last resort. So it is hard for me to fully agree with what Dr. Nasi wrote above. For one, I have come to believe from my long years of observation that there is no such thing as a cure for cancer! Remission yes, but not cure. I have seen cancer patients suffered recurrence even after six, 12, 14 or even 20 years! I am skeptical when doctors tell patients about cure! The idea of “whacking” the cancer real hard with toxic drugs or radiation trying to get rid of the cancer quickly seems a sensible proposition. Good logic but take note also that such aggressive treatment can not only weaken the immune system but also kill the patient! Many patients who came to seek our help refused to undergo chemotherapy as suggested by their oncologists. Why? Because they have seen how their loved ones or friends suffered or died during or after the treatment. I wonder why people don’t realize that! If this doesn’t happen to you, it does not mean it is not true! Read more to know what others have gone through. 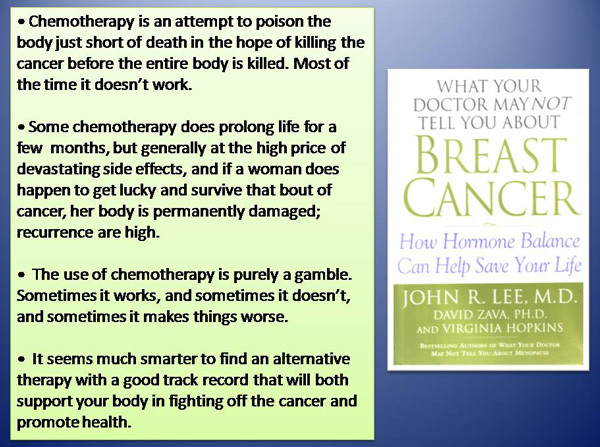 I also find it odd that people can sell the idea that chemo or radiation treatments can “control the cancer, reduce pain, relieve symptoms, avoid complications and sometimes extend a person’s life.” What about the short-term and long-term side effects? Some of our patients have outlived their doctors prognosis many times over. Because they live long enough, we started to see the long-term side effects from their previous medical treatments. Of course if they die soon after their treatments, no one will know what these long-term side effects are! I am not being anti-doctor by telling you all these. I am just sharing the reality from my perspective. And I am not alone on this. Many doctors and oncologists themselves shared similar experiences. 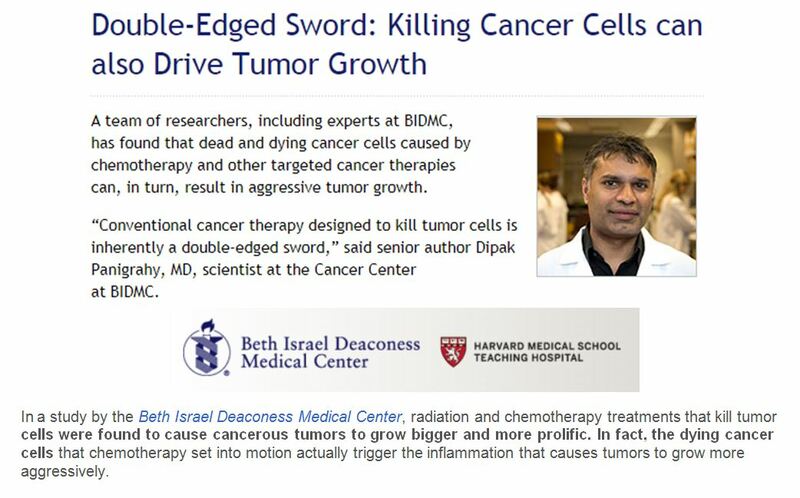 Dr. Nasi wrote: Fifty percent of those who receive a cancer diagnosis — and up to 90 percent with some kinds of cancer — are cured with conventional medicine. 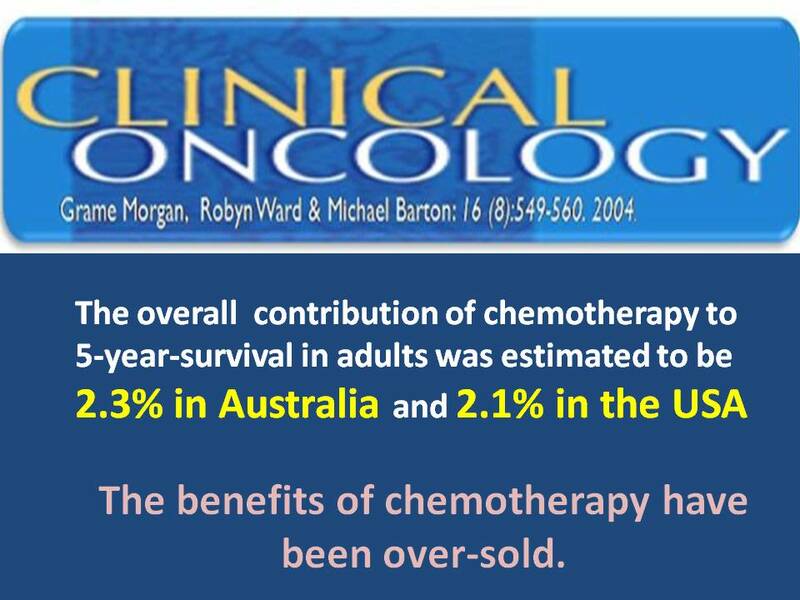 How do you reconcile such way off claim when some oncologists said the contribution of chemotherapy to 5-year-survival is only 2.3 or 2.1 percent! KF is a 52-year-old Malaysian. Sometime in 2015, he had a swelling in the right side of his neck. Apart from this there was no other symptoms. KF consulted the doctors in a private hospital in Kuala Lumpur. He was told he had NPC (nasopharyngeal carcinoma). He immediately underwent 6 cycles of chemotherapy and 35 times of radiotherapy. KF was okay after the treatments. He went back to his oncologist for routine check up every three months. Barely three years later (in March 2018) his cancer recurred and had spread extensively. KF was prescribed an oral chemo drug. He did not know what that was. But I guess it could be Xeloda since he had to take the drug for two weeks followed by a week of rest. This constituted a cycle of treatment. In total KF received six cycles of this drug. The drug did not make him any better. The oncologist then suggested KF undergo the the standard chemotherapy again. KF declined and decided to go to China instead. A PET scan was done before starting treatment in China. The results showed the cancer has spread widely and wildly. Numerous lymph nodes were infected with cancer. The cancer had also spread to his liver and spleen. In addition most bones throughout the body were attacked by the cancer. On 8 September 2018: Chemotherapy was given with Docetaxel and Cisplatin. On 11 September 2018: Fibroin gel sustained therapy was given. Medicine: Docetaxel, Cisplatin and Interleukin. On 13 September 2018: Degree 4 bone marrow suppression occurred which was relieved after the WBC boosting treatment was given. Discharge medication: Ilaprazole Enteric, Spironolactone, Megastral and Lamivudin. KF was in the Chinese hospital for 20 days and the total treatment cost was about RM60,000. KF was told to come back to China again for more treatment. He was due to return to China next week but was unsure what to do. He and his family came to Penang to seek our advice. Chris: You did all these things (chemo, radiation, etc). Did you ever ask the doctor if he can cure you? Daughter: Cannot cure, only can control. Cancer cannot be cured. C: Oh, the doctor told you cancer cannot be cured? C: For the past many years I have been telling people that cancer cannot be cured. There is no cure for cancer. Now at least someone else is also saying the same thing! D: Cannot cure but can extend life — prolong life. C: Prolong life for how long? C: Before you went to China — you felt good. Now that you have come back from China, did you feel better? Not better? No good? C: His condition got worse? And you are supposed to go back to China again (next week). You may need another RM50 K or RM100K. Yes, you can go back there again. But ask, what will you get out of this? More problems? C: So are you going back to China? This is an e-mail I received on 1 January 2018. I know you are reluctant to take on emails with regards to consultations, but please at least hear my case first. I was diagnosed with NPC in 1999, and gone through a course of radiotherapy in Melaka then. Melaka. It turned out to be liposarcoma, as mentioned in the three attached histopathology reports. Due to the involved margins, I was advised to go for a wider resection, and I did so at NCCS in late. September 2017). The histopathology report from the second surgery, also attached, showed that the regions are clear. I have attached also the operation report from the second surgery for your reference. Just a few days back, a CT scan showed that there is a recurrence at the neck near where the earlier tumor was. And for that, I will be travelling to Singapore tomorrow to consult the doctors again; I will most likely need a further surgery to remove the tumor, so said my doctor in Melaka too. I guess you may well ask that I visit you personally, and that I almost certainly will after the second surgery when I regain my strength, but please at least let me know for now, if you may, the options/paths that are open to me. I have read the testimonies of sarcoma patients at your website, and they offer me glimpses of hope in these dark days of mine. I got to meet this patient end of January 2018. Let me briefly outline what had happened. 1999 – diagnosed with nose cancer, NPC, Stage 3 and undergone 30 plus sessions of radiotherapy. No chemo. 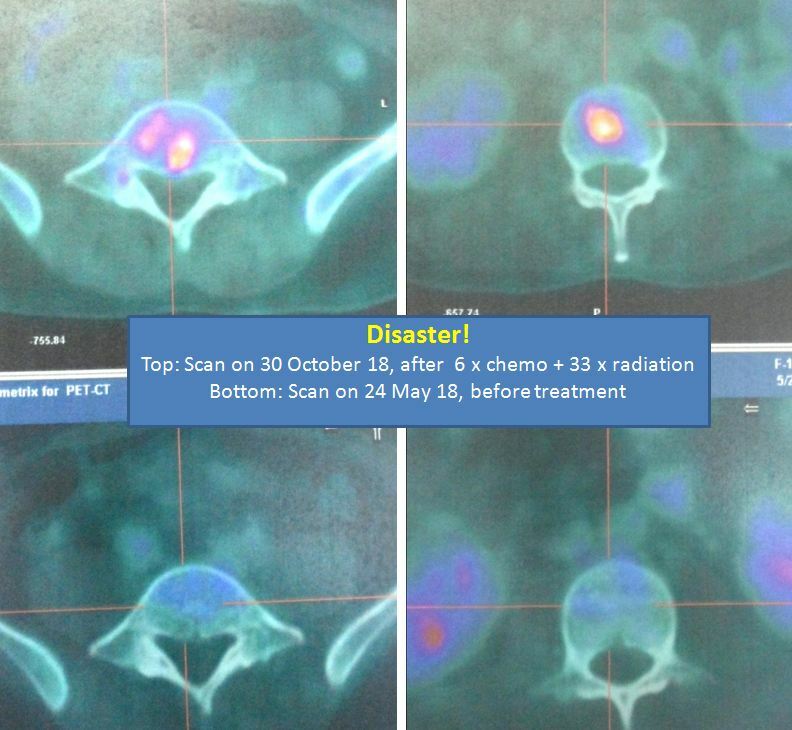 Side effects of radiation: dry mouth, thyroid function deteriorated and right shoulder “dropped” down. Study the picture above. His right shoulder is lower than the left. August 2017 — swelling in the right neck. It was malignant. Early September 2017 — did an operation in Melaka — margin was involved. End September 2017 — did second surgery in Singapore to remove a wider margin. 6. Mid-December 2017. Recurrence — a lump at the back of the neck. PET scan on 3 January 2018 confirmed nodal disease. January 2018 — third surgery was done. After surgery, the right cheek was swollen but is starting to get smaller. Total cost of the surgeries: About RM 200,000. If you or your doctors think that you are done with your cancer, unfortunately cancer is not done with you yet. Many patients don’t want to hear or don’t want to know this — After undergoing all medical treatments you are often told you are cured. To those lucky ones, yes — it may be true especially when patients die first before experiencing any side effects or recurrence! But if you live long enough, you may learn the sad truth that the cancer is not done with you yet. I have seen cancer comes back again even after 5, 10 or 14 years after an apparent “cure”. Radiation can cause new cancer down the road. In this case, the patient had NPC in 1999 and in August 2017 the cancer came back again. Then there is an added dimension to his problem. 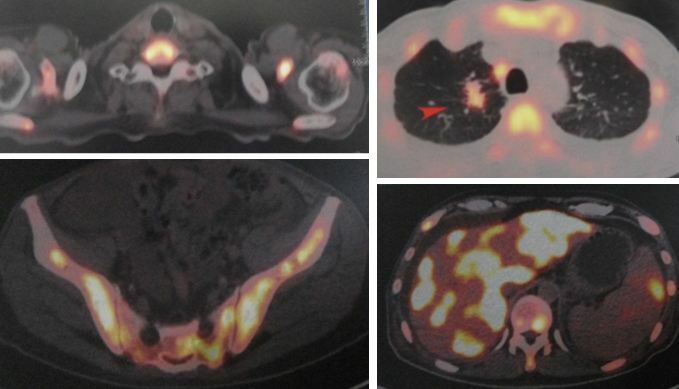 This is not a recurrence of this previous NPC but another new cancer — radiation-induced sarcoma. Many patients are not told or are not aware that radiation itself is cancer causing. Many patients after chemotherapy and radiotherapy may end up with another medical-treatment-induced cancer such as leukemia, lymphoma and in this case sarcoma. Patient had to undergo three operations over the past five months. I took some pictures below — indeed a tragic sight and indeed a sad morning for me. What can CA Care do to help? No, I cannot cure him. I have no magic bullet. But I hope to be able to help make his life a bit better. 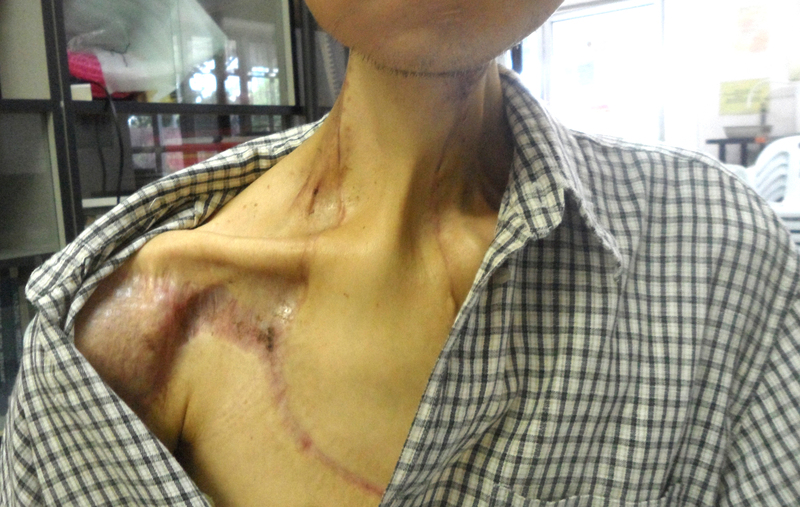 As it is now, he had difficulty swallowing as a result of the surgery. He can only take liquid food. If he drinks “pure” water he coughs. If there is something in the water, then it is okay. Mind boggling indeed. I only hope that our Oral Tea and Throat & Oesophagus Tea can help him in some ways. In addition, movement appears to be difficult due to the tense muscles. There is no pain but the entire head and neck feel numb. He was put on the e-therapy as a trial. He felt “loosen up” — less muscular tension. I have a feeling that this etherapy would be useful for him. If patients come to me earlier, before undergoing too much treatments, I guess I could do better. I recall having many patients with NPC. Some have undergone medical treatments mid-way and gave up. Some did not undergo any chemo or radiation. They took herbs and took care of their diet. They survived and did not suffer like this patient. Well I guess, you think such good results are just fluke shots or these people are just lucky! I have learned early — For those who believe, they believe. For those who don’t want to believe, don’t waste time trying to convince them! NPC: Undergo chemotherapy,100 percent cure; if radiotherapy, 80 percent cure. You believe that? I apologize for writing without the benefit of an introduction, I am writing this email, with hope that I can scheduled an appointment with you, on behalf of my father who has been diagnosed with nose cancer(T2N1). My father, Aba (not real name), 58 years old, has been diagnosed with nose cancer (T2N1) in February 2017 and was scheduled for 33 sessions of radiotherapy and 6 rounds of chemotherapy (4 hrs of cisplatin IV infusion),with an approximate total cost of SGD$9,700. He declined the chemotherapy treatment (oncologists here are very persistent, we had to go thru series of ‘debates’) but complied to radiotherapy treatments. We was initially ensured a total recovery. Doctor mentioned that only 30% suffered from mild side effects and seeing my father is young he is confident that my father will be able to spring back to life in seconds. Little did we knew, radiotherapy is just as bad. He is currently on his 13th session. The tormenting days started as early as day 2. He is unable to eat maybe because of the many big ulcers, sudden chills, fever, nausea/vomiting and scalded skin. He is so weak. And ever since radiotherapy, I noticed he started to develop tight congestive cough at night. As of now, he said he had lost his sense of taste and hearing to his right ear. On 6/6/17, during a scheduled consultation, we expressed our concern on his deteriorating health, and if there is anything that they can provide to aid him during this time, and they mentioned a few lists of medications in which they don’t recommended. Their only advice is to allow his antibody to fight it off naturally. At the end of the day, we was only prescribe with a tin of Ensure Vanilla powder. Disappointed with their lack of concerned and couldn’t help feeling betrayed, that was when we finally decided to called it off and stop the radiotherapy treatments. It has been more than 48 hrs from his last radiotherapy session and he doesn’t seems to be getting any better. Our family do believe in herbs but we have no knowledge on it. He has been taking rodent tuber and jus rerama (butterfly plant) as supplements for almost a month now. We sincerely hope you are willing to look into my father’s case. My father is eager to take all possible aggressive measures to combat this disease or at least to live peacefully with it. We understand that this is one of many such requests that come across your desk and greatly appreciate any guidance that you can lend. We live in Singapore and ensure that I have no issues travelling to Penang on behalf of my father for the consultation and also the follow up treatments. Thank you, in advance, for your help. I look forward to hearing from you at your earliest convenience. Reply: Come and see me with all the medical reports and scans … no need to bring your father … only you come ….. fly in the morning … go back in late afternoon. 9 Feb. 2017: Right PNS biopsy — Non-keratinizing papillary squamous cell carcinoma. 23 Feb. 2017: MRI – Nasopharynx and Neck — right nasopharyngeal mass (4.8 x 3.9 x 3.0 cm) with extension across midline and into the right parapharyngeal space with right mastoid effusion. Enlarged right lateral retropharyngeal node, 1.4 x 1.2 cm. 23 Feb. 2017: Bone scan — there is no conclusive scan evidence of bone metastasis. 5 April 2017: Diagnosed with T2N1 nasopharyngeal cancer, EBV negative, p16 positive. 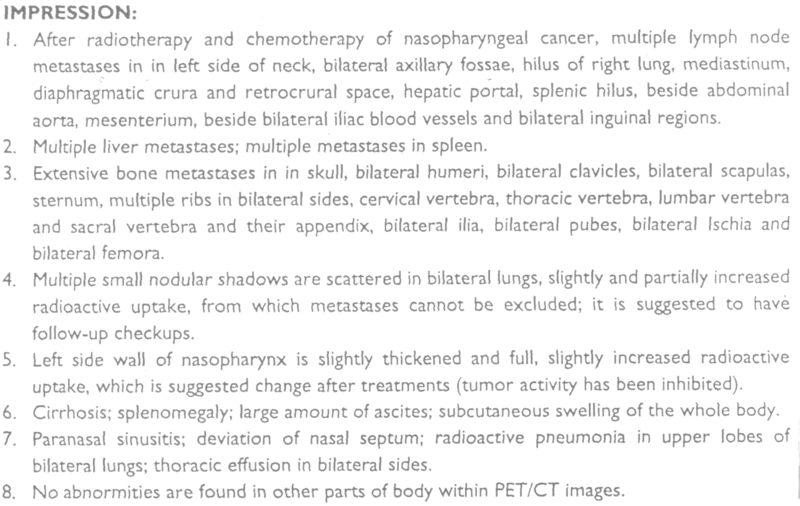 stable size and extent of the known right nasopharyngeal tumour. slightly larger right lateral retropharyngeal lymph nodes — 1.5 x 1.2cm fro, 1.4 x 1.1 cm. larger cystic right level 2 lymph node suspicious for nodal metastasis — 2.2 x 1.5 cm fro, 1.3 x 0.7 cm. Aba’s daughter (let’s call her Linda) and her husband came to seek our help. We talked for more than an hour. Below are some excerpts of our conversation that morning. Here are some of the points we discussed. Linda: He was told to go for chemo – 6 times and radiotherapy – 35 times. He declined chemo but went along with radiotherapy. Chris: Chemo! Can cure or not? L: The doctor said, 100 percent cure with chemo. The doctor also said if the patient is my father or mother, I would also ask him/her to do the same. C: So chemo can cure 100 percent. What about radiotherapy? L: If he did radiotherapy it will be 80 percent cure. L: The doctor also said that only 30 percent of patients will suffer from mild side effects of radiation. C: Mild side effects? That’s what the doctor said? L: The doctor said my father is still young. C: Did you father know that the doctor said the radiation side effects is very mild? C: And after 13 times of radiation, why did he gave up? L: He had bad mouth ulcers, etc. When to see the doctor and was told no medication to help him. Only let the body’s antibodies (immune system?) help him. Why are you so against chemotherapy? C: Chemo would give a 100 percent cure — why don’t you ask your father to go for chemo? Son-in-law: He wanted to go for it. L: I quarrelled with the doctor. I have read a lot of stories. Even my uncle — he had one cycle of chemo for his colon cancer and he wanted to die already. Only one shot, and want to die already. Oncologist pushing my father to go for chemo! L: When I told the doctor that I don’t want my father to go for chemo, she was like trying to put the blame on me — if my dies, I would be the one responsible for it. C: The doctor was really pushing you on that? How old is this oncologist? L: She is a young lady doctor. SIL: Some young doctors are like that! Very pushy — chemo, chemo, chemo! L: She said, this is the standard American protocol. C: (From my experience) Nobody can cure any cancer! There is another young oncologist who told one of our patients. In my professional life as an oncologist, I have not come across a case where a patient dies because of my chemotherapy! Fellow patient undergoing the same treatment already died! L: There was another patient who also underwent the same treatment (like my father in the same hospital). Last week my father asked the nurse what had happened to him. The nursed checked and found out that he already died. Mom with colon cancer. Surgery but refused chemo. Ten years still alive! L: I read a lot. C: Before you father got cancer, did you also read? L: Actually my mother also had cancer — colon cancer. She went for surgery but she refused chemo. It’s now ten years. She never go for any check-up and she is still alive. We cannot change human attitude. So let me tell you honestly — out of ten patients who come and seek our help, only three patients would benefit from our therapy. We cannot help the remaining seven patients because we cannot change their attitudes. We can help the cancer but we cannot help human beings. You need to take care of your diet. You cannot eat anything you like. So what to eat now? I can’t help people like that! I know many people swear and curse me because I say you cannot eat this and cannot eat that. SIL: My father is a very stubborn person. He likes to eat — so we have to change him on that. C: That is the problem. I have no herbs to make him change his attitude, his stubbornness. I can tell you, I give up on such person. No use. My experience is when he gets well, he will not listen to my advice anymore. He eats anything he likes and he dies. There are many lessons we can learn from this story. It pays to read and read, to know more. It is not enough to just go and see an oncologist and believe he/she can take care of you. Linda read about her father’s cancer treatment. She took note that her uncle almost died after one shot of chemo. Linda’s mother also had cancer. She was told to undergo chemotherapy after her colon cancer surgery. She refused. She is still alive after ten years! When the oncologist told Aba and his family members that chemo was going to provide a one hundred percent cure of his NPC, Linda was skeptical. You can only be skeptical and dare to question the doctor if you have some basic knowledge of what cancer treatment is all about. Unfortunately, many patients dare not ask. And they don’t read. They swallow everything that is being fed to them! Experience and wisdom are what you need to look out for when it comes to making life and death decision. Read and ponder the following wise words of Dr. Ruggeiri below. It is not difficult to understand what Dr. Paul Ruggieri is trying to tell us. 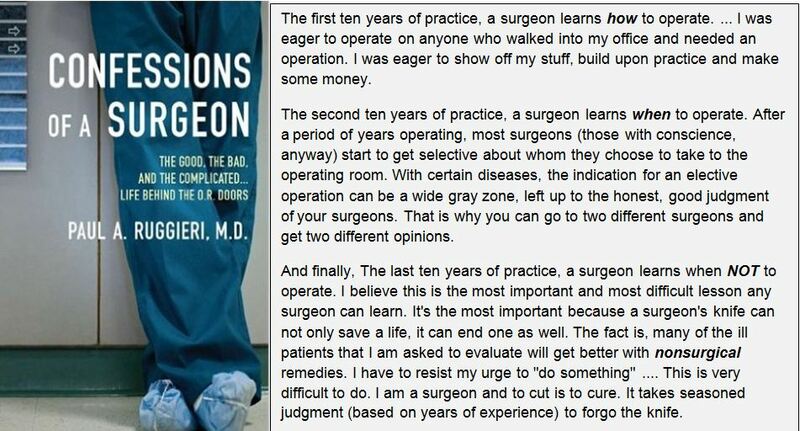 Substitute the word surgeon with oncologist and see how the message strikes you! It may sound like this … the first ten years of practice, an oncologist learns how to chemo people …. she is eager to chemo anyone who walks into her office … she is going to show off her stuff …. bla, bla, bla. So if I have a choice, I would choose an experienced, sympathetic and wise doctor rather than a sweet, young one! (I know it is hard, wishful thinking?). Radiotherapy provides a 80 percent chance of cure. And only 30 percent of patients suffer side effects. Even that, according to the oncologist, these side effects are mild. Do you believe that? Obviously this oncologist does not know what it is like to suffer from the treatments she is dishing out to her patients! Pastor Danny had NPC and underwent chemotherapy and radiation treatments (using the same drugs as recommended for Aba). And he suffered severe side effects. Suffered severe side effects of radiation – mouth sore, difficulty swallowing, burnt skin, etc. At the same time, he received two cycles of chemotherapy. The side effects were worse than radiation and he had to be hospitalized. He was unable to sleep, was in pain and became anxious and depressed. He was put on morphine and as a result suffered constipation and hallucination. The treatment caused much misery. I would rather die – it was miserable and never again! The treatment burnt my whole throat – like it was on fire. My wife cried, because I couldn’t drink even a drop of water. I could not walk by myself. I was not told about the side effects of radiotherapy. I have no more salivary glands (that is why in the video you see Peter having to taking sips of water very often when talking to us). I was not told about the side effects of chemotherapy – the only thing mentioned was hair loss. I stopped chemo after the fourth cycle – I was too weak. I developed a phobia for “needle”. The veins in my hands just “disappeared” when I see a needle! Doc, you call these mild side effects? The oncologist told Linda that chemotherapy can provide a one hundred percent cure! 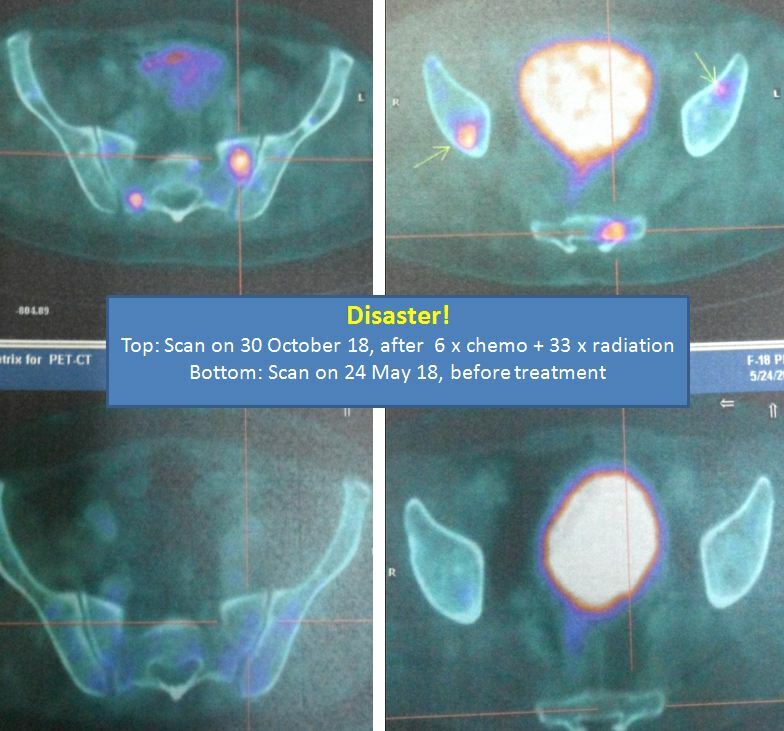 What the oncologist did not tell is that chemotherapy can also come with a heavy toll! Sometimes, chemotherapy kills. According to Linda, a fellow patient undergoing the same treatment as her father died along the way! Is that not proof enough? Read what these two doctors say. That he failed to offer her surgery as an option. The patient died six months after seeing this famous oncologist. The disciplinary tribunal found that Dr Ang “had no reasonable basis” for saying there was a 70 per cent chance of response and felt that he had “wrongly held out false hope” to the patient and her family. He made the claims intentionally even though he knew or ought to have known there was no basis for him to do so. The judges said doctors were obliged to present the range of viable options and what the pros and cons of each of these were. Patients must get to decide for themselves what treatment they want, the judges added. “It was not Dr Ang’s role to decide, but to inform,” the judges said. Cancer patients, can you learn anything from the above episode? Ju (not real name) is 36 years old. Her problem started with severe headaches. Then both sides of her neck became swollen, making it difficult for her to turn her head. She had to take painkiller everyday. Ju consulted an ENT specialist in a private hospital. She was told that she had either NPC (nose cancer) or lymphoma. Whatever it was, Ju was asked to undergo six cycles of chemotherapy. She would probably have to undergo radiotherapy as well. The doctor told Ju that with the treatments she would have a 80 percent chance of cure. Ju promptly rejected medical treatment and came to seek our help. Chris: What did they want you to do? Ju: Chemo (6 times) and radiation (did not ask how many times). C: Did you ask if chemo and radiation are going to cure you? J: Eighty percent chance of cure. C: What happen if you don’t do the treatment? J: May be die la! No, I did not ask. C: Do you believe that success rate is 80 percent? C: Why don’t you believe the doctor? J: Because of bad past experience. My mother also had chemotherapy for her lymphoma. She was 63 years old then. She was supposed to do 6 cycles of chemo but she died after finishing 5 cycles. C: Where did she do the chemo? J: In Penang (the same oncologist that Ju went to). That was 5 years ago, in 2010. C: So you know that chemo does not cure cancer but can also kill. C: She had 5 cycles and that means about 5 months of treatment. J: Yes. Each cycles cost IDR 5 million. C: So for 5 cycles it cost IDR 25 million. Money gone, mother also died. I understand. It is very hard for me to push you to go for chemotherapy. It is difficult. You are still young — 36 years old. And now they tell you to go for 6 cycles of chemo. J: No, I don’t want chemo. That’s why I am here. I was a cancer chemotherapy specialist doctor for twenty years.I treated thousands of people with various combination chemotherapy regimens. I don’t think I killed any of them with the treatment – though over two thousand died from their cancers. I am going to ask the same question that I asked Ju: Do you believe what this “great” cancer doctor said? 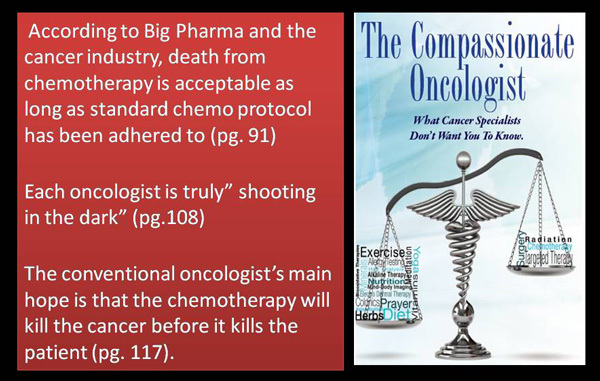 Nobody can or will give you any guarantees with chemotherapy.Why do think it will most likely kill you? What evidence are you basing this on? … Some people conclude that the treatment is worse than the disease, and myths about people being killed by chemo bolster this belief. It isn’t always effective. But in those cases it is the cancer, not the treatment, that kills the patient – they have died in spite of treatment, not because of it. So now, the logic is …. it is the cancer that kills you, not the poisonous chemo! That is what they want you to believe. Another good selling point. Suspected Nose Cancer Resolved After Two Months On Herbs. And She Refused A Biopsy: Why? 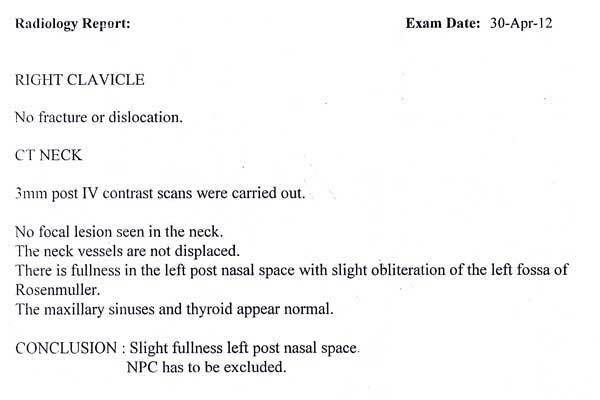 The ENT specialist suspected NPC (nose cancer) and suggested that Fit proceed with a biopsy. If it is positive for NPC, then she is to undergo radiotherapy. Fit refused further medical intervention and came to us for help. It was indeed a difficult situation for us. We were not able to proceed because we did not know what this is in the first place. Especially for young patient like Fit – only 37 years old – we would prefer that she undergoes medical treatment for whatever problem she has. We do not want to mislead her into believing that our therapy can cure her. So she was adamant that she would not want to proceed with further medical intervention. We prescribed Fit Capsule A, Mt Guava deTox tea and NPC 1 tea. We made it clear to Fit that she has to come go back to her ENT doctor again within three months for further checkup. If her problem persists then she has to consider undergoing medical treatment. Fit came back to see us again on 13 July 2012, i.e. after two months on herbs. She had just gone to see her ENT and was told that she was nothing wrong with her anymore. The swelling had disappeared and her “nose was clean.” Fit also said that since taking the herbs, her discomforts had resolved. Before coming to us, she used to have headaches and her neck muscles felt tight. These were all gone. This is another amazing story of healing. I asked Fit if she wanted her face covered in our video presentation. She replied: No! She wanted to share this good news with all of us without having to hide her identity. I was curious why she was so adamant in refusing to proceed with a biopsy – i.e., risking her life for not wanting to “catch her cancer early.” Listen to what she has got to say. Fit: My sister had breast cancer. She underwent chemotherapy. I do not want to go through a similar experience. Even if I have to die, I don’t want to suffer like her. Chris: Oh, you used to have a sister? And she had breast cancer? F: Yes, breast cancer in 2005 and she had a surgery to remove her breast, followed by chemo and chemo until March 2008. And on 20 March 2008, she died. C: From her operation to her death – how long was that? F: Three years. She received two cycles of chemos each month for three years. Initially she was alright but she suffered recurrence after recurrence and her condition “dropped” rapidly. She had to use the “chemo-port” because all the veins in her hands could not take the chemo anymore. In February 2008, the doctor said there was no need for any more chemo. My sister would only have two to four weeks to live. We brought her home and she died a month later. Since her death, I have heard of a name, Dr. Chris Teo. Since then I kept this information in my heart. When I was told that I might have NPC, I did not cry. I just wanted to come and see Dr. Teo. FEG-avid right nasopharyngeal mass. There is effacement of the right parapharyngeal space and extension across the midline. Hypermetabolic right retropharyngeal, right level 2 and 3 adenopathy. Necrotic enlarged left FDG-avid level 2 adenopathy. Impression: Right nasopharyngeal tumour. There is also right retropharyngeal adenopathy, left level 2 cervical node and right level 3 node. A biopsy was performed and confirmed cancer of the nasopharynx, T2N2Mo. Pastor Danny subsequently underwent chemotherapy and radiotherapy. He successfully completed 33 sessions of radiation but managed to complete only 2 cycles of chemotherapy (scheduled for 6 cycles). The chemo-drug used was cisplatin. Danny suffered severe side effects of the radiation treatment. In addition, chemotherapy was equally severe. After the first cycle of chemo, he suffered nausea and vomiting and has to be hospitalized. In late December 2011, Danny had to be hospitalized again due to febrile neutopenia (fevers and infection). When the time was due to Danny to undergo his third cycles of chemo, he decided that he had had enough. He did not want any more chemo. It was at this stage that we received the following email. My pastor Danny (from Singapore) has got nose cancer Stage 3. He has just finished his radio therapy treatment and has 4 more dosages of chemo to go thru. Last month as I was sharing with my cousin Bobby from Singapore, he shared that his elderly dad got colon cancer several years ago and undergone your treatment. He has since been well and out of cancer. Bobby mentioned that (Mr. Lee in JB would be able to help). My pastor Derek would like to bring Danny to your centre for an appointment…. Appreciate your reply. Pastor Danny was subsequently prescribed herbs: Capsule A, NPC 1 and NPC 2, Lympho, Chemo-tea, Radio-tea and Mt. Guava deTox teas and was told to take care of his diet. He benefited from our Therapy. Within a few days he bounced back to ”real” life. On 26 April 2012, we received an e-mail from Pastor Danny. Thank you very much for turning my medical condition around! Tried calling you to break the good news, but cannot get thru la. I managed to share with Mr. Lee, and he is so happy for me. My MRI result shows all is normal and EBV blood test shows virus undetectable! Amazing? I am amazed, at NPC stage 3, I just made an U turn from death, and I’m thankful to you and Mr. Lee for the herbs and the amazing Capsule A! See you in May. Danny. 28 March 2012 – EBV Quantitative PCR = Undetectable. 30 January 2012 – EBV Quantitative PCR = Undetectable. Less than 715 copies/ ml. 19 October 2011 – EBV Quantitative PCR = Detected. 7,997 copies /ml (3.90 log). 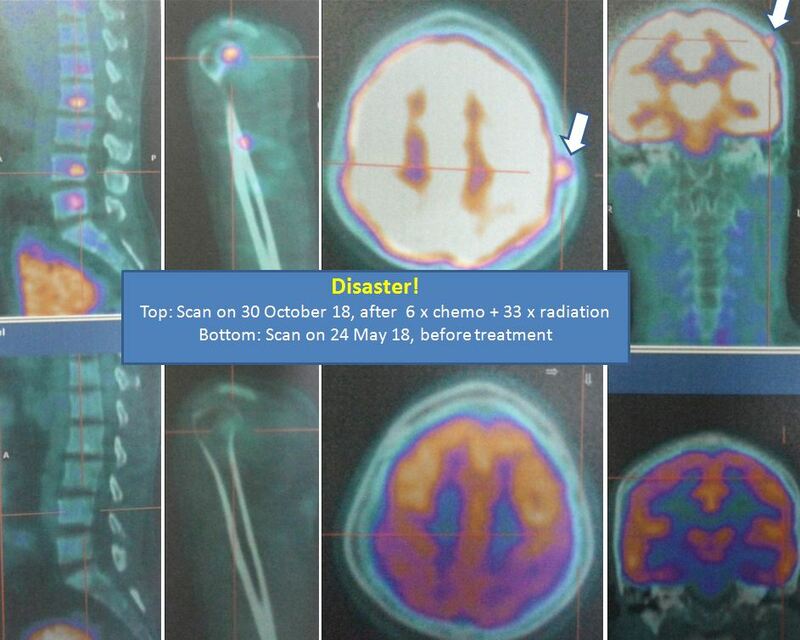 MRI 4 April 2012 – Compared to previous MRI done on 27 February 2011 (note: The date on this report is obviously wrong. It should have been 21 October 2011??). Interval resolution of nasopharyngeal mass. No evidence of residual disease seen. Interval decrease in retropharyngeal lymphadenopathy, now within normal by size. Interval decrease in cervical lymphadenopathy, most are within normal size criteria except for a right upper level 2 which is borderline in size. Pastor Danny came to see us again in Penang on 12 May 2012 and shared his story. Let him walk you through his cancer journey and share with you some of the darkest hours of his life. Acknowledgement: Thank you for your permission to share this story without having to hide your real identity. Diagnosed with Stage 3 nose cancer in October 2011 and underwent radiotherapy and chemotherapy in November 2011. The diagnosis of Stage 3 cancer meant it was a death sentence. There was only a 30 percent chance (whatever that means!). There was no hope and no choice. He had to undergo medical treatment because that was the only way to go. He had to put up a “false front” and behave himself – being a pastor who needed to show a good example. In this darkest hour of his life, Did you ask God – Why? No, he did not because cancer seemed to be a part of his family. His mother died of nose cancer too – many years ago. Many other members of his family also had nose cancer. At the lowest ebb of his life, he felt he could not make it and was ready to die. In fact, he sent an sms to a friend requesting what to be done for him if he passed on. I was just a living thing – existing. He had total belief in modern medicine. That probably was the only “sure” or logical way to “fight” the cancer. He was not open to alternative therapies because he was not sure of them and did not have enough convincing information about them. He suffered severely from the medical treatment. Many friends around him persuaded him to give up chemo! But he would not listen! He reasoned, If I go for chemo, at least I have a chance! My life is a stake. At last, a friend managed to break through with the message that herbs from CA Care would be able to help. He was convinced but not enough to totally discard chemotherapy. He still wanted to go for his third cycle of chemo. But somehow the third chemotherapy was deferred and that gave him the chance to start taking CA Care’s herbs. Three days on the herbs, he bounced back to life. He had more energy to talk to friends and walk and was able to attend church and took morning walk. With his health back – he thought he had a strong enough base to go for chemotherapy again! Part 4: The Breakthrough – Cancer in remission! His desire to continue with chemo had upset many of his friends. You are going better with the herbs, why are you going for chemo again? He told them, You all did not know what I have gone through. I was desperate to get well. I am willing to die to become well. After a trip to Penang and consultation with Chris – he was satisfied, for we at CA Care would not compel any one to do what he doesn’t want to do or stop anyone from doing what he wants to do. It is your life and you decide what is best for you! My mission is to empower you with adequate, truthful information. Not under pressure anymore, he decided to stop chemo on his own accord. The next day he went to his oncologist and for the first time told her the he was taking CA Care’s herbs and he would not want to continue with further chemotherapy. To his surprise the oncologist readily agreed! She was not “mad” at him at all. Also it came as a surprise that the oncologist broke the news that there were no more EBV in his blood and the mass in his nose had resolved. In simple language, he was considered “cured” or was in remission. There was no further need for chemo. He had only to come for routine checkup. On 12 May 2012, he came back to Penang and shared his story with us. Now, it was our turn to give him our advice on how to stay healthy. Eat anything you like? That’s going to be the greatest mistake you will ever commit in your life. So take care of your diet. You are not cured of your cancer yet! The cancer can come back and strike you again! So don’t be complacent or fooled by this good news. Learn from the experiences of others before you. Learn from their mistakes and successes if you want to live long. Nose (NPC) Cancer: Chemo and He was Dead Six Months Later – Why? Why are we here? We are not here to die – there is a purpose in life. This is where the belief in God has to be very strong – to make you understand why you are in this world. Do not ask God “why”, but “how” you can go through this. Try to understand why this happened – examine your diet, your lifestyle and your environment. If I were to get cancer again, this is what I would do – open my mind to new possibilities – to alternative medicines, herbs, etc. 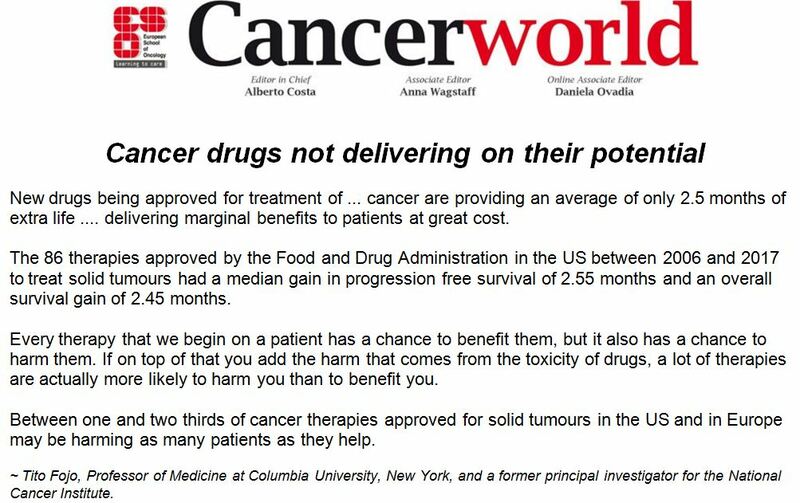 The options should not be confined to just chemo or radiotherapy. What have you got to lose if you get to know more about cancer? The more you know the better prepared you are. Demystify cancer! Now that you are alright – what would be your reaction if I say that you can go back to your old lifestyle again? No way! For me it is no sugar, no Ovaltine, no Milo, no salt – since I am with you. There is no sugar in my house! No milk … brown rice. Most of my friends told me – Oh, my goodness, it is so difficult. You have not missed your old lifestyle? No, I never missed that – I go on. I just continue growing. The perception is that the quality of things depends on what you did in the past. Excuse me I am enjoying my life. My standard of quality cannot be the same as I was before. I am now at a much higher level (of awareness). Right now my life is different. I enjoy things differently. I don’t drink beer. I don’t drink any alcohol. I used to indulge in those things when I was with my friends. But now I still go out with them but I just drink my water! When I have dinner with them, they eat their food – pork and meat etc. but I have my own food! Why must someone impose their values on you? Their idea of quality of life need not be the same as yours. The healing path advocated by CA Care is not an easy path to follow. Healing does not come easy. Many patients write us e-mails everyday. What they are looking for is an “instant, magic bullet” believing that they can find “cure” to their problems by just sitting in front of the computer in the comfort of their home. Again I say, our healing path is not easy to follow. Don’t come to us if you are not prepared to change – change your diet, change your lifestyle and change your attitude. We cannot help you if you cannot change. Dr. Dan Chesnut, M.D. (in Lying with Authority) said this, “Every person who was successful in finding safe alternatives decided at some point in their illness to open their mind to change and to learn solutions outside the accepted norms”. 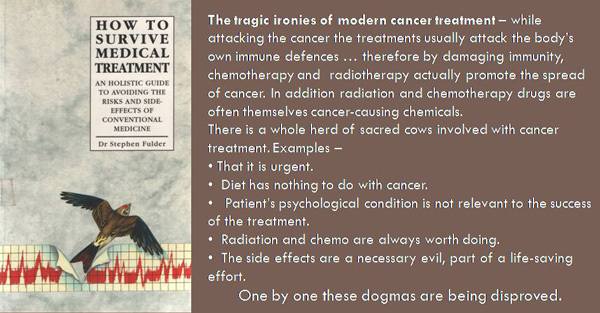 May I add one more advice to cancer patients – Healing or curing cancer is not about undergoing chemotherapy or radiotherapy or taking of the so called “scientific” medicines. These alone are not enough or could even be disastrous. You can heal cancer by using you own common sense. If you are offered an invasive treatment that does not make sense to you – how do you respond to that? Healing cancer is all about educating yourself so you can stop doing the things that causes cancer and start doing the things that heal cancer. This means you need to take the responsibility of healing upon yourself and not passing on that responsibility to others or the “experts”. Does this cancer bring you any meaning at all? It is my wake-up call. This is my experience. I now recognize that I am mortal. I recognize that I have done something wrong to my body or it may also mean that we are living in a wrong place. This is God telling us. Before you had cancer, you never realize all these? No. What was your impression about life then? Life is forever! You are forever young. Invincible. Solve the whole world’s problem – you are young and you are reckless. That is why I realized that this wake-up call is so important. Without cancer I would not be able to recognize this. Wake up to reality – my body has changed, why haven’t I recognized that too? After this wake-up call – what changes followed? Everything changed. Priority of life changed. In the past it was always work fist, now no more. My commitment to society is stronger now. I cannot imagine the degree of corruption, the pollution to the environment – we are supposed to nurture them not creating problems. In the past, I was compromising for the sake of “food security” – but that cannot be more of a fake statement. I have cancer but I have hope. Yet there are others who lack hope or have no hope at all – why? This is because there are not empowered. So cancer has changed my whole perspective of how I view my work. Also my family. Before work came first, family second. Now it has changed – family first. My family, I treasure them more. There are two kinds of people living in this world. One kind are those who believe there is no God – no divine purpose. We live in a world where things “just happen” randomly – perhaps just a coincidence. In contrast, another kind of people are those who believe that everything that happens for a reason. This is a part of the Grand Design. I don’t know which group you belong to. Certainly we in CA Care and Peter are in the same group. We believe in God – our Heavenly Father. My entire life now has been embraced by people struggling to find meaning for the events in their lives. It’s taken me a long time, but I now see that even in the worst disaster, there are wonderful gifts, hidden opportunities or life-enhancing lessons. We see it in little ways or in not-so-little ways. I want to assure you – When you discover the true meaning of the events in your life, everything changes. You feel stronger because your sense that everything has meaning gives you great confidence. You feel wiser because you see how everything connects. You’re more in touch with who you are because you know that you’re living the life you were meant to lead. And you’re happier because you’re able to put your loss behind you and have a sense of a future filled with good things. Until you get to this place, nothing is going to feel right. Indeed I feel sorry for those who lead a “blind” life – rushing through their journeys on earth, but not being able to learn anything from their experiences. If we are not prepared to look into ourselves we are not going to be able to go forward. Later while on the treatment, I found that in cancer they are just talking about cure for five-years (i.e., 5-year survival rate). The doctor was very clear. She said after five years if the cancer comes back it is going to be a new cancer – a new disease. Meaning I collect another new cancer. Then patients will have to undergo a new treatment regimen all over again. When I talked to God, He promises healing not cure. That was when an “angel” came into the picture and told me about you and the role of CA Care. Your role is about healing not curing. I told the radiologist, “I am going for healing not cure”. She replied, “There is no such thing as healing.” She told me, “Our job is to cure you!” But look at the 5-year-survival rate of Stage 2 to 3 for this cancer. There is a 70 percent chance of survival – for five years and 30 percent will die within five years. Before starting with the treatment, did you not ask the doctor about the survival rate? At that point in time, you don’t ask anything. You are more concerned with how to go forward. The assumption was that doctors know everything and they know what they are doing. And they will be able to cure me! I assumed that doctors will tell you about all the side effects. My assumption was wrong! At that time, I was looking forward to getting out of it, so there was no desire to go and find out what was going to go wrong with the treatment. No, no, we don’t do that. I believe that … the greatest danger to your health is the doctor who practices modern medicine…I believe that more than ninety percent of Modern Medicine could disappear from the face of the earth – doctors, hospitals, drugs and equipment – and the effect on our health would be … beneficial. I believe that modern medicine’s treatment for disease are seldom effective and that they’re often more dangerous than the diseases they’re designed to treat. If you are sick … your first defense is to have more information about your problem … You’ve got to learn about your disease and that’s not very hard. You can get the same books the doctor studied from. (Read them. It is most likely that after reading you will be more informed than the doctor himself). Doctors in general should be treated with about the same degree of trust as used car salesman. Whatever your doctor says or recommends, you have to first consider how it will benefit him. You should seek out and talk to people you regard as having wisdom. (Doctors tell you – don’t listen to the untrained, the quacks or pseudo-scientists). But Dr. Mendelsohn wrote, They are wrong – they are protecting their sacred authority. You may find that you can do without the doctor! Unfortunately we live in the world where we are made to believe that modern medicine and its accompanying technology is proven and scientific. This is far from the truth. Dr. Peter Ooi is no “school kid” and he understands what science is. When the radiologist said there is no evidence that herb is going to help she is just being naïve – ignorant at best. Peter ‘s answer to her was right on the spot, “No evidence does not mean that it does not work!” If you don’t look for evidence – you find no evidence. And if you deliberately don’t want to find evidence you will not find one either. It is as simple as that! Dr. Sydney Singer is a medical anthropologist. Read what he said. Now, I hope you see some light. There is a big difference between curing and healing. A cure is a successful medical treatment that removes all evidences of the disease. A cure is what the physician hopes to do and hopes to bring to the patient. For example, the liver is resected. The tumour is gone. That is supposedly to be a cure! Healing goes beyond curing. It is an inner process through which a person becomes whole. Healing takes place at physical, emotional, mental and spiritual levels. The capacity to heal physically is necessary for any successful cure but healing can also take place at deeper levels whether or not physical recovery occurs. There are cancer patients for whom curative treatment ultimately proved impossible; yet inner-healing process takes place. Healing brings inner peace and a sense of connectedness with the Absolute One, thus makes a transformative difference in the quality of life. For those who have found inner peace, travelling the healing journey takes a new meaning. At that point, there may be pain but there is no suffering. In the many years dealing with cancer patients I have to come to realize that you will not win fighting a “war” with cancer. You also cannot defeat cancer with your professional pride and ego. To win, cancer patients need to look inside themselves – know what their weaknesses are and then learn to live with their cancer. An “angel” – my secretary – read about CA Care in the net. She made copies of your articles and left them on my table. She saw my sufferings and was very much against what I was doing. From your website I got to know what you are doing. In CA Care you talk about healing and that is what I am looking for – the approach fits into my scheme of thinking. To me herbs are the way to go to build up my immune system to “fight” whatever is the cause of my problem. This is my wake up call. God talked to me – “Cancer is not my way of torturing you.” This cancer is God’s way to making me realize that something has gone wrong in my life. Healing is also related to my diet and the environment. The taste and smell of the herbs are bad – what was your reaction to that? I am a Chinese brought up in a Chinese family – we learn that good medicine is supposed to taste bitter. It did not matter to me. Cancer healing requires change – did you change? Having cancer requires that I change – my diet, my lifestyle, my perception towards life – and I will change. I want healing as promised by God. God does not talk about curing. I have been taking the herbs since 2001 until now (as of this writing – 2012 – eleven years). There is no adverse reaction or side effects of the herbs. After taking the herbs, I felt much better – I can sleep well – my piles problem had resolved – that’s the good side effect. What do you think are the main contributing factors that make what you are today? Change – change of lifestyle, change of diet and reliance on the herbs. Empowerment comes from knowledge generated by your own experience. It is a learning process. This is where the role of your CA Care comes in. With knowledge you are always challenged – to see things critically. Why is this not good and why is that not good. Living today you are challenged all the time. This is why knowledge is so important. With the experience that you have gone through and with the experience that you have acquired – do you need to fear if the cancer comes back again? It is not that I don’t fear – I always hope that I don’t get it again. But even if I get it again I know what I am going to do. This is the crux of empowerment. Most people, after their treatments would go home and don’t know what to do – wondering when cancer would strike again. At CA Care we take a different approach to healing cancer. To us, cancer is not just about a tumour in your nose, breast or lung. It is about you, as a human being. Our experience tells us that if you want to heal yourself, one most important thing you must do is change – change your attitude, your lifestyle and your diet. There is no two ways about it. To know is knowledge, but knowledge without practice is no use! There is no point knowing if you don’t want to practice what you have learnt. To practice means to change. Most people find it very hard to make changes. They like to keep old habits, live the same lifestyle and keep doing the same things. How can they ever become better? The story of Dr. Peter Ooi (currently Professor) was kept untold for a decade. But as 2012 set in, I thought it would be wonderful to share his cancer experience with you all. So I wrote Peter telling him about this and below is his e-mail reply on 26 January 2012. The Lord be with you and indeed thanks to you. Dr. Chen, the ENT specialist that I consult annually from Glenagles, Singapore confirmed that I am indeed healthy. He suggested that I continue with my diet and the herbs I take from you … Dr. Chen also shared with me his views that 11+ years is a good sign for remission. You may know that I am now tasked with setting up the Department of Agriculture and Food Sciences … I took up the professorial chair as I wanted to share my belief in the God given richness of our agro-biodiversity and the need to help students understand that we can have profitability without sacrificing the environment and play God … I have no objection to you using my name in your video clip. Yes, I am proud to say that I believe in a more holistic approach to healing as it is in the good hands of the Lord. You may refer to me as Peter Ooi to confirm that I am a Christian and a Hokkien as NPC is more common among the Hokkiens and Cantonese. Once again, thank God for people like you. God bless. Dr. Peter Ooi was 51 years old when he was diagnosed with nasopharyngeal carcinoma (NPC – nose cancer) Stage 2/3 in 2000. At that time he was with the FAO (Food and Agriculture Organisation of the United Nations) in Bangkok. Later Peter became the Director of the Asian Regional Centre of the World Vegetable Center, also based in Bangkok. Peter “immediately took up the aggressive procedure of both radiation and chemotherapy.” He completed 35 sessions of radiation treatments and at the same time received chemotherapy. He gave up chemotherapy after four cycles – the treatment made him too sick! Let him tell you what it was like to be at the receiving end of radio-chemo treatments. The oncologist could not answer the questions I asked, such as why use this or that drugs? It is always the standard answer that they give – “standard regimen or protocol”. It is indeed our privilege to be able to help Peter at the time when he needed us and also to be able to share with you his cancer experience. This video recording was made in Bangkok, in 2007 – about seven years after Peter started to take the herbs. I hope those reading this story will benefit from Peter’s experience as much as I benefited and enjoyed our conversation that day. There is this common perception that only the “uneducated, kampong folks” who opted for alternative medicine – and they go to the “quacks”. Is that right? Far from it – here is Dr. Peter Ooi – a fellow scientist – realising that the standard fare dished out to cancer patients is not good enough and is not the answer to our present-day cancer problem. In fact the reverse seems to be true – those who know or are knowledgeable enough turn to holistic, alternative treatments when they get cancer. Why? One lesson we can learn from Peter’s experience is that cancer doctors do not tell their patients the whole truth – only half truth. It is left to patients themselves to learn (and often through the hard way) the other untold half of the whole truth. Why are they so evasive about the “bad” effects of their treatments? Do they ever admit that most of the time their treatments do not work or may even kill patients? Read the story of LCC – he died within six months while undergoing chemotherapy for his nose cancer. 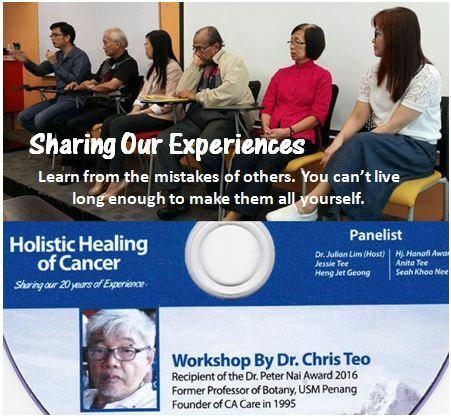 Click this link: https://cancercaremalaysia.com/2012/01/26/nose-npc-cancer-chemo-and-he-was-dead-six-months-later-why/ Peter’s experience is not much different – he was drained of his energy and unable to walk by himself during his treatment. But he was wiser – he abandoned his chemo after the fourth cycle. Of course to the chagrin of his brother-in-law, a medical doctor. LCC (H412) was a 54-year-old male. He was a welder when young. Later he had his own business – involved in steaming “kuih” (local dessert). Sometime in early 2010 he had mild bleeding from his nose. But by March 2010, the bleeding became serious. Later a lump appeared at his neck. A CT scan on 2 April 2010 showed multiple lesions in the right and left lobe of his liver. The largest was in Segment 6 measuring 3.1 x 4 cm in diameter. Conclusion: Features suggestive of liver metastases. His cancer was diagnosed as NPC (nasopharyngeal carcinoma) Stage 4. LCC subsequently underwent 6 cycles of chemotherapy using Gemcitabine + Cisplatin. This treatment cost him RM 6,000 per cycle (total cost RM 36,000). After the chemo, LCC felt better and his nose block resolved. But this “feel good” did not last and the treatment did not cure him at all. A bone scan on 6 September 2010 – i.e. barely 5 months after treatment – showed extensive bony metastases involving both the clavicles, multiple bilateral ribs, multiple thoracic and lumbar vertebrae, both humeri, both sacro-iliac joints, both ischii, both femurs and both pubic bones. LCC agreed to undergo the second round of chemotherapy. Unfortunately this second round proved to be a disaster. His white blood counts dropped, so were his platelet count, red blood count and haemoglobin. The doctor told the patient and his family that chemotherapy had to be abandoned because the drugs were not suitable for him. LCC was asked to take oral chemo-drug instead. The total cost of this treatment was going to be RM 83,000. On 14 September 2010, K the patient’s cousin wrote us an e-mail. My cousin … has just finished his second round of chemo. He is quite weak and needed blood transfusion before they could complete the second course of chemo. He has decided to discontinue the chemotherapy and would like to come up to Penang to meet you at any time convenient to you. They plan to fly up in the morning and back to KL on the same day. The patient, his sisters and K flew to see us in Penang on 26 September 2010. Below is our conversation that day. Did you ever ask your doctor if chemo was going to cure you? Never ask. But my brother believed in what the doctor was going to do for him. Did he believe that the doctor was going to be able to cure him? Yes. Your Aunty had lung cancer. She did not go for chemo and was doing well. Patient lost confidence in his oncologist after the chemo did not cure him. He looked forward to meeting us – CA Care was his last one stop. Soon after he died. He received his first chemo on 6 April and by 15 October he was dead – within 6 months after chemo. The Agugraph above showed low qi energy – total 23%. His Lung qi was low, while the Heart, Small Intestine, Triple Energizer, Spleen, Liver Bladder qi were split. Those who have undergone invasive medical treatments suffer from such problems. 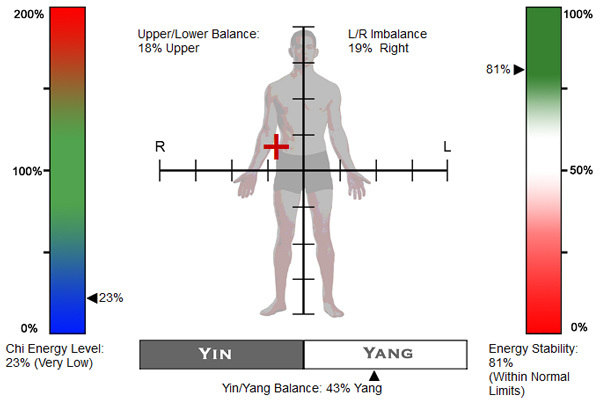 His yin-yang balance was slanted towards yang – 43%. Thank you once again for receiving us last Sunday out of the normal operating hours. Just to give you an update on cousin’s progress. The herbs are doing wonders for my cousin. He finds much relief from the herbs, especially the Pain Tea. Since taking the teas on Monday, the pain has lessened tremendously. However, this morning, he developed a slight fever. The fever is gone now but in the afternoon, he started to purge – at least seven times thus far. There was no tummy upset though and he was eating his usual meals. He also has a bit of phlegm – there were some traces of “black threads.” Is there any course of concern? Kind regards, K.
On behalf of my family we would like to thank you again for receiving us on that day and we really appreciate your advice. My brother is doing much better after taking those herbs. Best regards, F (sister). Want to update you on my cousin’s condition. The swelling on his legs has reduced a lot. Brother said he is a little breathless at times and I noticed that too. Prof., is there anything that we could give him to help? Other than this, he said he is doing fine. Thanks and regards, K.
Sorry to bring you this bad news. My cousin passed away early this morning. Although he was eating, he was getting very weak. At least his suffering was short. Thank you both for all assistance. Regards, K.
I have just got back from my cousin’s place. My cousin sisters and cousin’s family would like to express their sincere thanks and appreciation for all your help, support and advice given. The herbs really helped to ease his discomforts. He did not suffer much pain towards the end. In fact, he was really high in spirit wanting to fight on and continue with the teas, but the body failed him. Thank you once again for all the help. Kind regards, K.
Did chemo cure him? Helped him? Or killed him? You make your own conclusion! He did not believe in herbal therapy, in spite of the fact that his Aunty was doing alright with our herbs and had refused chemotherapy. (Note: His aunty had Stage 4 lung cancer – an open-close case) and was given a few months to live. It has been many years now and she is still alive.) Nevertheless, we respect the patient’s belief and he paid dearly for this belief, in terms of money as well as his life. Most of us have to learn the hard way. Let us try to look at reality. Is there any “medical or scientific” evidence that chemo can cure a Stage 4 cancer? The patient had spent RM 36,000 for his first round of chemo. What did he get in return? More cancer in his bones! Why was the cancer spreading so widely in his body? Then the oncologist suggested more chemo after the extensive metastasis. Is there any evidence to show that chemo can give meaningful result? There was another RM 83,000 to spend for the treatment. What could anyone expect that? How much is life worth? When we first started CA Care in 1995, this is what I wrote in my book, Cancer Yet They Live, pg. 14. Many people would say that “Ah, another quack. This is giving us false hope. Another attempt to extort the last dime from a dying person. If doctors cannot help, do not tell me some insignificant herbs can do any good! … I know we are not medical doctors but we are not money hunters either.” Be careful, some people are just after your money not your cancer! Reflect seriously on what I say! Do you see anything “wrong” or half-truths in the above statement? Lenin said, “A lie told often enough becomes the truth.” You get that message? HG is a 53-year-old male from Singapore. In November 2010, he had a slight headache. His blood pressure was elevated. The doctor prescribed him medication for a month but this was not effective. His problem developed into double vision. An eye specialist could not found anything wrong with his eyes. HG was referred to an ENT. A brain MRI was performed. There was no indication of anything wrong. A nasal endoscopy done also did not reveal anything wrong. Nevertheless the ENT performed a biopsy. A biopsy report dated 9 November 2010 indicated a non-keratinising, undifferentiated nasopharyngeal carcinoma of the left post-nasal space. The doctor suggested radiation or chemotherapy. HG declined the treatment, believing that this is too invasive. In February 2011, GH consulted another ENT in private practice. A nasal endoscopy was again performed. Again, nothing was found. A biopsy was again done. 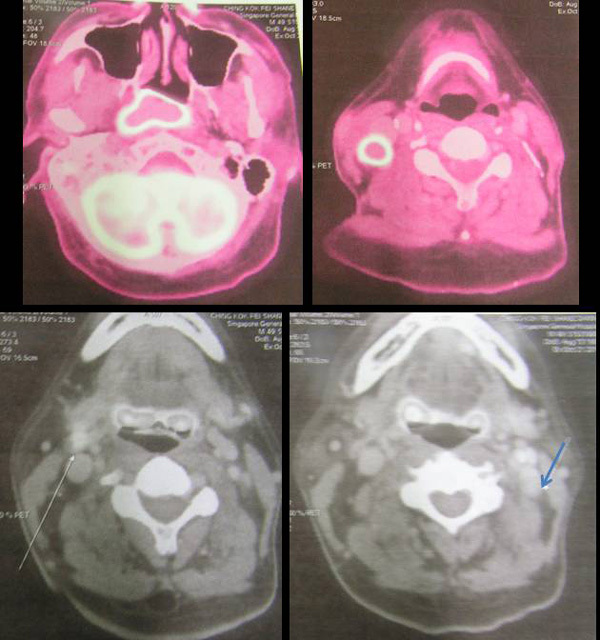 The result confirmed previous finding of an undifferentiated nasopharyngeal carcinoma. HG was in a real dilemma when he came to see us on 22 July 2011. He wanted to try the herbs. HG was prescribed Capsule A, deTox tea, NPC 1 and NPC 2 teas, Brain Tea and Pain Tea. For his frequent urination he was given A-Kid-6 tea. We reminded HG that we would not promise any cure at all. If after taking the teas for a few weeks and there was no positive indication, then HG should consider finding someone else or something else to help him. We suggested that GH consult another doctor. He shook his head violently and said, NO!